Back in 1985, when Dr. Michael Broome began treating hyperthyroid cats using radioiodine, things were very different than they are today. In those days the only facilities that treated hyperthyroid cats were veterinary teaching hospitals affiliated with large universities. The university teaching hospitals that initially offered radioiodine therapy for hyperthyroid cats were primarily focused on teaching students, and less concerned with the particulars of the radioiodine therapy experience. “I received my post graduate training in nuclear medicine and comparative thyroid physiology at one of the best universities in the world, the University of California at Davis.” says Broome. The client and patient experience in a teaching environment like the Veterinary Medical Teaching Hospital at the University of California at Davis (or the VTHM as it is known by the veterinary students, residents and clinicians who work there) is however, affected by the logistics incumbent on a teaching facility. “When I started treating cats with radioiodine in 1985 the teaching hospital kept the cats in the hospital for almost a week before treatment to perform time consuming tests to determine the percent of iodine uptake and the effective half life of iodine in each individual hyperthyroid cat”, says Broome. “Initially we thought these tests were needed to ensure the optimal outcome of the treatment.” Subsequent studies, some authored by Broome during his post graduate work in Davis, have shown that those extra kinetic tests don't provide information that improves the outcome of the radioiodine treatment in most cases. Eliminating the need to perform those tests before radioiodine therapy reduced the amount of time hyperthyroid cats need to be hospitalized by close to a week. Just like human patients, cats given radioiodine as treatment for hyperthyroidism do become temporarily radioactive themselves. It is this transient radioactivity that requires the veterinary facilities that perform this therapy to transiently hospitalize the cats to ensure limited interaction and contact with people. Radioiodine therapy for people with hyperthyroidism (primarily caused by a condition called Graves' disease) had been used for decades, indeed it was introduced in the mid 1940's. However, in 1985 there was little information available about the use of radioiodine therapy in cats with hyperthyroidism. As a result regulatory agencies, like the Radiologic Health Branch of the California Department of Health, were unfamiliar with how to regulate the process in cats. In 1985 cats treated with radioiodine for hyperthyroidism at the VMTH in Davis were required to remain hospitalized for 2 weeks after the radioiodine therapy. Indeed, the combination of pre radioiodine treatment studies and lengthy post treatment hospitalization resulted in a total hospital stay for cats receiving radioiodine therapy of close to 3 weeks. Never-the-less, despite the lengthy hospital stay, the promise of a lifelong cure of the disease prompted large numbers of people with hyperthyroid cats to seek out this therapy. As a result facilities like the VMTH at the University of California, Davis soon developed a back log of appointments for people choosing this therapeutic option. “After my time at the University, it occurred to me that we needed to create a method of offering this profoundly valuable therapy that was more focused on the needs of the patient itself. This meant a shorter hospital stay.” says Broome. In 1986 Broome returned to his native southern California to establish the world's first private practice exclusively for the treatment of feline hyperthyroidism. Located in Orange County California, Advanced Veterinary Medical Imaging (originally named Veterinary Nuclear Imaging) began offering radioiodine therapy for cats with hyperthyroidism utilizing a schedule that ensured the cats would remain in the hospital for only 1 week. To streamline the process of radioiodine therapy AVMI performs the thyroid scan (more accurately called a thyroid scintigraphy) needed to confirm the patient's diagnosis and assist in radioiodine dose determination, on the same day the cat is admitted for therapy. Based on its initial success, AVMI opened a second office in Los Angeles, California shortly thereafter. In the years following the successful launch of AVMI in southern California, the Radiologic Health Branch of the California Department of Health eased regulatory requirements such that most cats are now eligible for discharge only 3 days following radioiodine therapy. These changes represent a major reduction in total hospitalization time for radioiodine therapy when compared to the original cats treated in the early 1980's. Despite the dramatic reduction in the length of hospitalization, many clients continued to express concerns over the nature of their catʼs accommodations during the hospitalization for radioiodine therapy. In 1999, after close to 15 years treating hyperthyroid cats with radioiodine, AVMI opened the doors of a new facility dedicated to providing the optimal therapy and environment for cats needing radioiodine therapy for both benign and malignant thyroid disease. During that 15 years a handful of other veterinary facilities had opened in southern California that also provided radioiodine therapy for cats with hyperthyroidism. The logistics of the isolation needed for the procedure resulted in most of these facilities dedicating a single, small isolated room for the hospitalization of cats needing radioiodine therapy. To overcome its clients concerns over the conditions encountered by cats receiving radioiodine therapy AVMI's new facility boasts a separate feline radiotherapy ward with large picture windows providing its occupants with a sense of separation from the activities in the rest of the facility while avoiding the claustrophobic conditions usually provided for cats undergoing this therapy. To ensure that the feline patients hospitalized for radioiodine therapy at AVMI enjoy a truly optimal experience, Synder Cat Cottages™ were installed. 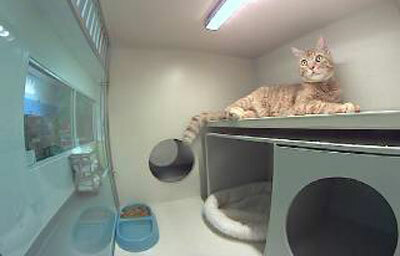 These spacious individual living quarters boast large, elevated shelves for cats to stretch out on, as well as cozy bedrooms for napping and even individual cat hide-a-ways for cats seeking the security of apparent isolation. Each cottage has a private adjoining bathroom that contains the patient's litter box and is equipped with its own exhaust fan ensuring an odor free environment for both cats and caregivers alike. Most hyperthyroid cats are clinically stable when referred for radioiodine therapy. And the radioiodine therapy itself is amazingly non-stressful. As a result, most hyperthyroid cats undergoing radioiodine therapy do not require continuous 24x7 monitoring. The variety of conditions that sometimes occur concurrently in hyperthyroid cats, especially thyroid induced cardiovascular disease, do result in individual cases that warrant a more aggressive monitoring schedule than is usually available for cats undergoing radioiodine therapy. However, the very nature of the isolation required of patients receiving radioiodine therapy makes direct persistent supervision of the patient impossible. Veterinarians and technicians in constant contact with radioactive patients day after day, week after week, year after year, would themselves receive potentially excessive levels of radiation exposure, limiting their ability to perform these duties over time. From the very beginning AVMI designed its new feline radiotherapy ward with the goal of ensuring optimal supervision of every patient hospitalized for radioiodine therapy. 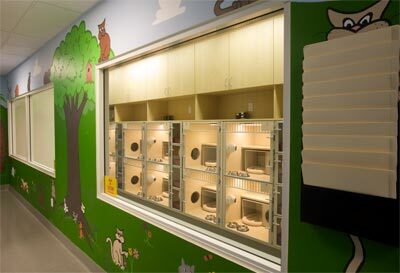 The feline radiotherapy ward is set up with multiple large picture windows to allow veterinarians and technicians the opportunity to observe these patients throughout their hospitalization. Despite the improvement in patient monitoring enabled by these design changes however, the veterinarians and technicians providing care for radioactive patients are restricted by the same principles that require your dental technician to exit the room when taking your dental radiographs. The dental technician who takes your dental radiographs does not leave the room because the individual exposure from 1 dental x-ray is harmful, but because the cumulative exposure this person would obtain over a career taking dental radiographs could be. Similarly, continuous direct supervision of cats receiving radioiodine therapy could prove problematic to those providing care for them. There is a solution to this problem however. And this is where technology enters the picture. 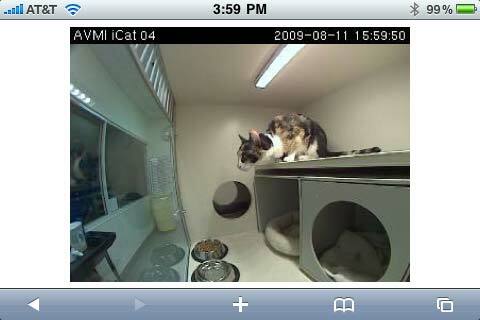 Recently AVMI improved upon its original design by incorporating personal web cams (cleverly called iCat web cams) for each and every feline patient hospitalized for radioiodine therapy. 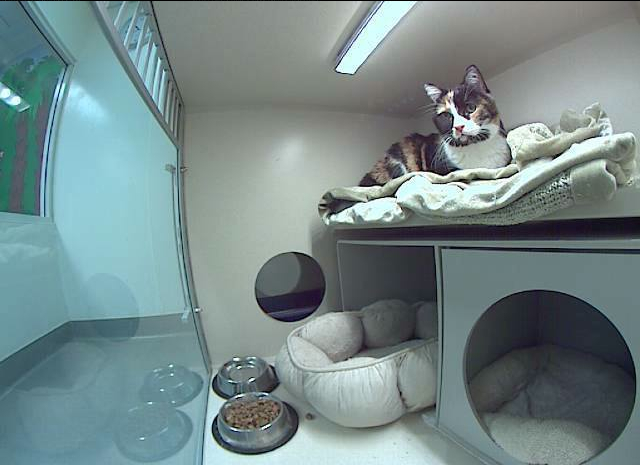 “Not only do the iCat web cams allow each client to personally keep tabs on their own pet while it is hospitalized, but they also allow us to monitor each patient continuously throughout it's stay.” says Broome. AVMI clients can be provided with their own personal web link that allows them to view a password protected web cam that is actually mounted inside their cat's cottage. While the client is able to view a continuous live web based motion picture of their own individual cat, our staff technicians and doctors have 24 x 7 access to a web interface that allows individual or simultaneous viewing of every cat hospitalized for radioiodine therapy. This solution provides clients with a real sense of confidence in how their cat is doing during its hospitalization. 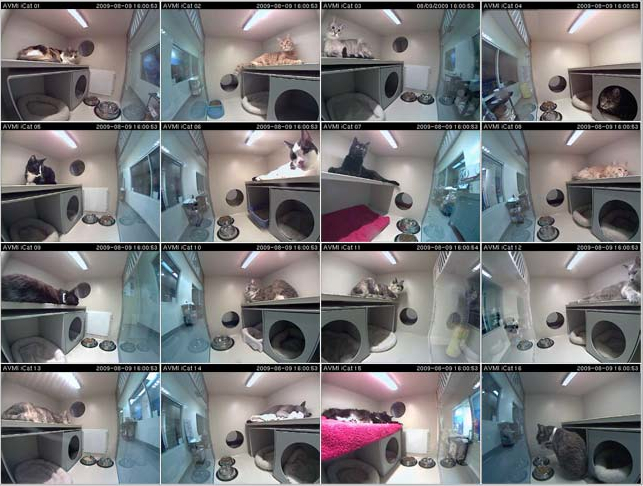 Indeed, the interface is so flexible that many clients have actually kept tabs on their cats by viewing their personal iCat web cams from their iPhones even while at work. How these client's employers feel about that remains to be seen.